Preheat the oven to 375 degrees. Spray a baking sheet with cooking spray. Pour the flour onto a small plate. Cut the cheese sticks in half. Roll the cheese sticks in the flour. Place the breadcrumbs and Italian herbs in a small container with a lid or zip-top bag and set aside. Pour the egg substitute into a shallow dish. Using one hand, roll the floured cheese sticks in the egg mixture. One at a time, using your other (dry) hand, transfer the cheese sticks to the bread crumb mixture and shake to coat. Using the dry hand, remove from the crumb mixture and place on the baking pan. 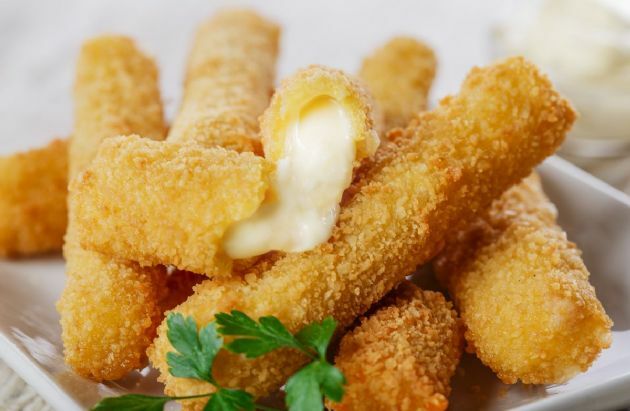 Continue until all the cheese sticks are breaded. If desired, dunk these cheese sticks in low-sodium tomato sauce (calories not included).